• What is the surface being cleaned? • What are the soils? • What’s your cleaning method? Manual? CIP? Machine? Ultrasonic? • What is the cleaning temperature? • Do you need a validation method? You’ve done your homework, run trials and have chosen the right cleaner for your cleaning application. Now it’s time to start to clean! How much cleaner should I use? How do I know when it’s time to change the solution? For many industrial and critical cleaning applications, it is extremely important to use a consistent cleaning process and keep the cleaning solution at a desired strength. Concentration control methods are procedures used to determine the concentration of a cleaning solution to ensure process consistency. When the concentration of the detergent drops, you know it’s time to change it. Refractive index is the “measure of the bending of a ray of light when passing from one medium into another.”¹ A refractometer is used to measure refraction. The refractive index is one way of measuring the amount of a substance in an aqueous solution. A higher refractive index indicates a higher amount of cleaner present in the solution. Conversely, a lower refractive index indicates a lower concentration of cleaner in the solution. If changes to the refractive index are found, it’s time to change your cleaning solution. Conductivity “measures the ability of a given substance to conduct an electric current.”² Conductivity, measured in micro-siemens, can be used to determine the concentration of a cleaning solution. Cleaning solutions have a higher conductivity than water. So, a drop in the level of micro-siemens in your solution is an indication that it’s time to replace it. This method is used for cleaners that are alkaline based (a pH above 7). Total alkalinity measures the ability of a cleaner to neutralize acid. It assesses the cleaning solution’s buffering capacity – its resistance to changes in pH caused by acid. 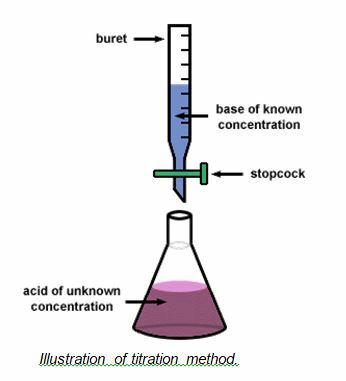 Total alkalinity is tested by performing a titration, a technique where a solution of known concentration is used to determine the unknown concentration of another solution. 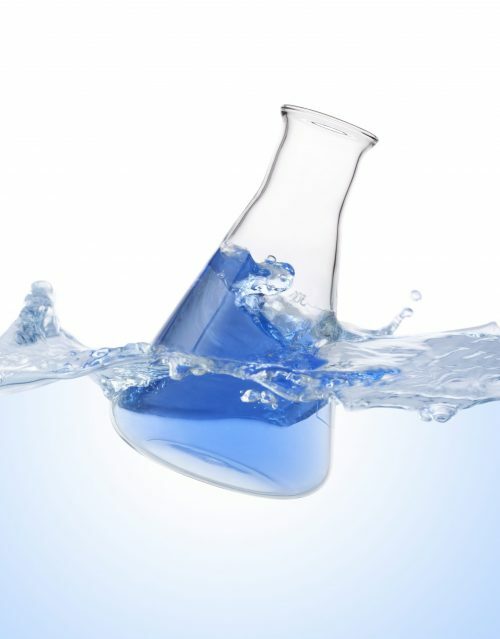 Alkaline builders bind hard water ions, so the surfactants can do their job. Without sufficient alkaline builders, the surfactants would come out of solution and become ineffective. If the results show that the pH of your solution has decreased by one full pH unit, it’s a good indication that it’s time to change your cleaning solution. This method is used for cleaners that are acid based (a pH below 7). Total acidity measures the ability of a cleaner to neutralize alkalinity. Similar to total alkalinity, total acidity is also tested by performing a titration. 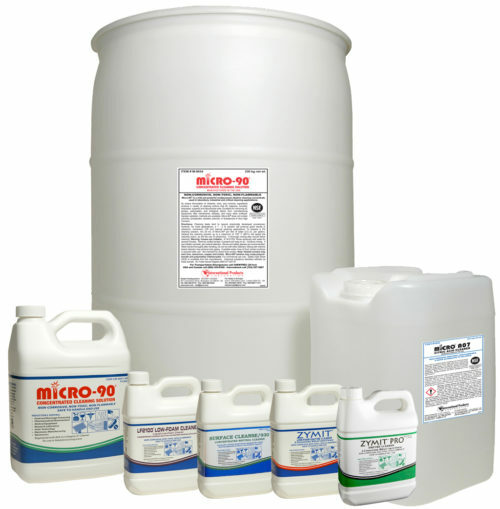 Changes in the pH of your cleaning solution occur once the soil load capacity of the cleaner has been saturated, indicating it’s time to change the solution. Surfactants in cleaning solutions reduce surface tension, and, as a result, air may become entrapped. This leads to the formation of small bubbles or foam. If the cleaning solution is agitated, either by shaking vigorously by hand or in a blender, a layer of foam will form. The total volume can be measured in a graduated cylinder, and a foam level curve can be created by plotting the known concentration of the detergent versus the measured total volume. If the foam heights of various known concentrations of detergent are calculated, an equation can be created to determine the concentration of future cleaning solutions whose concentration level is unknown. All of these methods for calculating the concentration of detergent in a cleaning solution can be converted into simple equations. 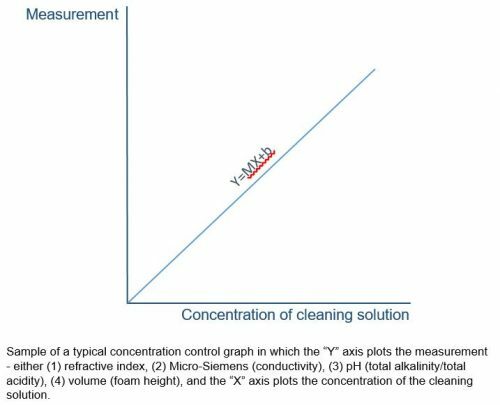 The data obtained can be plotted on a graph and the slope of the line can be used to calculate the concentration of detergent in your cleaning solution. If you see that the amount of detergent has dropped, you know it’s time to change your cleaning solution. 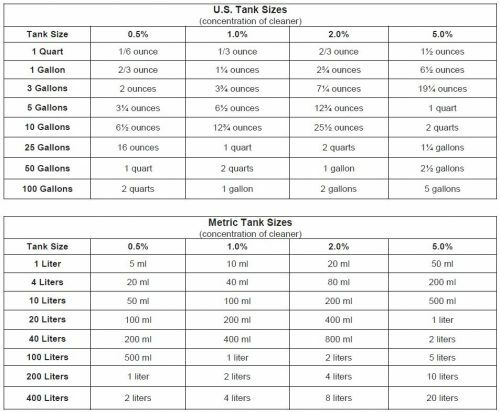 Need help calculating the concentration of your cleaning solution? IPC’s concentration control methods primer can help. Or contact IPC’s application specialists for assistance.